Every jaunt into the kitchen for me is an adventure. As mentioned before, in honor of Portus Cale, I wanted to make a kale soup, but got distracted with cauliflower soups on Pinterest. 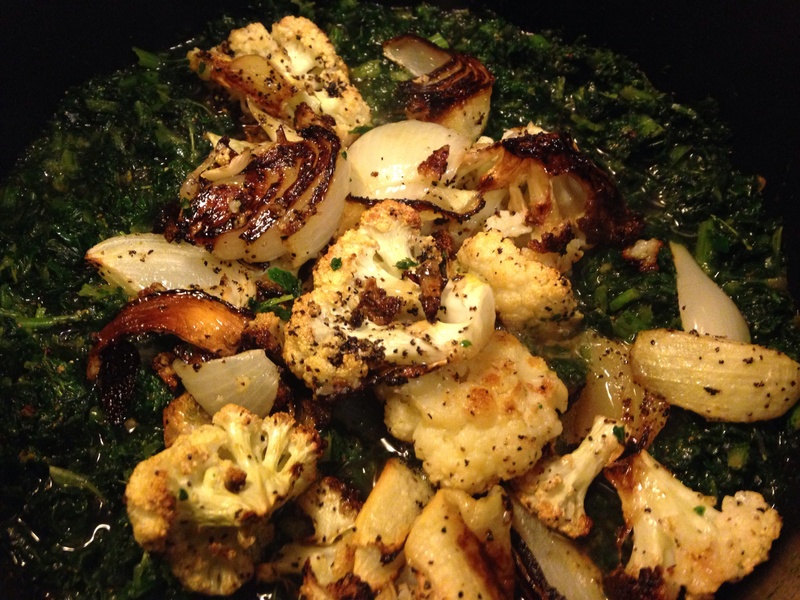 But when I found a recipe by Martha that used collared greens and dill (not a favorite herb of mine), I thought why not use kale and cilantro and, of course, ROAST the cauliflower?!?! The result? Good, but not great. I mean, don’t get me wrong, it was tasty and I ate it–because well, anything is good with a copious amount of very garlicky toast!–but it wasn’t everything I imagined. The roasted veggies smelled so amazing, they almost went straight into my tummy instead of the soup! Here’s what I did: roasted a head of cauliflower, 2 medium onions, and a head of garlic. While that was roasting, I sauteed a few green onions, 2 diced potatoes, and kale in olive oil, beer, and water. I added roasted veggies and a large bunch of cilantro. I pureed, added salt & pepper to taste and then added about a cup of greek yogurt and a squeeze of lemon. Simple and, like I said, tasty but not O-M-F-G! And yes, while it rarely happens, I always expect OMFG even on the first try. Less kale (I forgot, because I don’t often use kale, how in-your-face it is–so a little goes a long way in flavor). The beer wasn’t bad, but I think a nice buttery California chardonnay would be better. I need to work on the timing a bit more, like adding the cilantro a bit later. While I love my immersion blender, I couldn’t get my soup as smooth as I’d like it–next time I won’t be so lazy and will break out the ricer or blender. Alright, I’ll keep tweaking and get back to you. In the meantime, I think I might just have another bowl. PS–when making garlicky toast in the oven, make sure you keep an eye on it lest it get a little too, uh, crispy. I know you’re thinking 27 reasons to what? like soup? like Portual? do the hokey-pokey? While all great answers, nope. It’s 27 reasons to like cauliflower. It’s probably one of the most underrated veggies out there. I can count on one hand the number of people in my life that have actually uttered the words “I love cauliflower.” But you should because it’s related to broccoli–and we all know how healthy broccoli is!–and is high in Vitamin C, potassium, folic acid, and fiber. So stop your moaning and groaning, it was King Louis XIV’s favorite and if it’s good enough for him, it’s good enough for you. As you will recall, my last post was Portus Cale and I mentioned at the end that I had an epicurean inspiration, which was…kale! Don’t panic, we’ll make our way over to cauliflower, I promise! So, Cale = kale…genius, right?!?!? 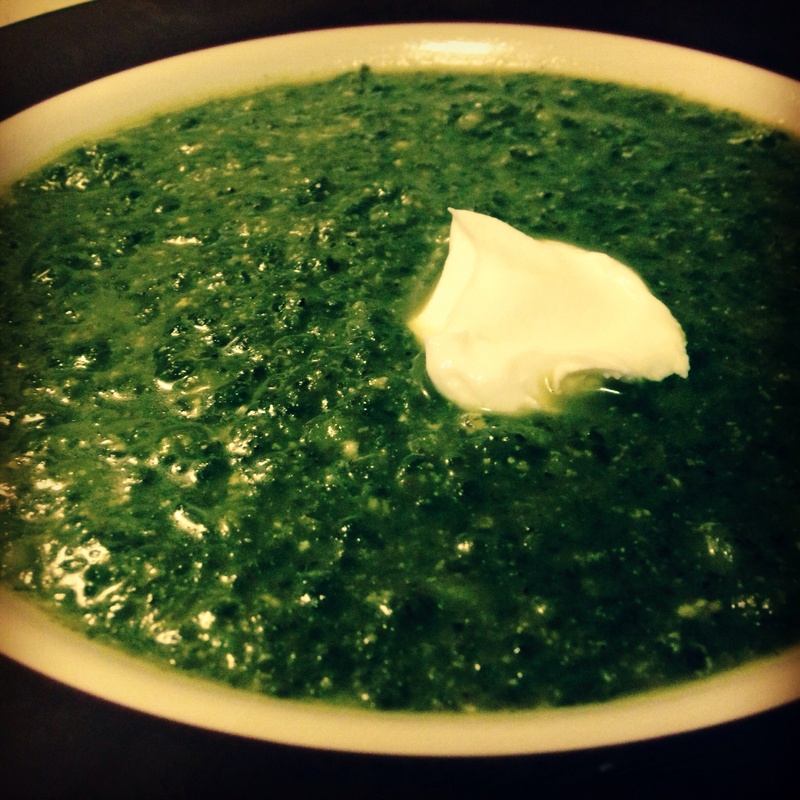 Since January is Soup Month here in the Epicurious kitchen, I thought I would find a kale soup. A recent post from The Homesick Texan using kale in her chicken posole verde is actually what made me think of it. So, I got on Pinterest and started looking for soups with kale or other greens in it for a bit of inspiration. BUT, all I could think about once my Cale/kale genius started to wane is that I have a lovely head of cauliflower in the fridge and how nice it would be to make a cauliflower soup….so I started researching that as well. But of course, as one does when one is on Pinterest, I got sidetracked and found this great article on Buzzfeed about new and exciting ways to cook using cauliflower (helllllllo, pizza!) and thought I would share it whilst I was creating in the kitchen. Click on the pic below to magically be taken to the wonderful world of cooking with cauliflower! Enjoy! 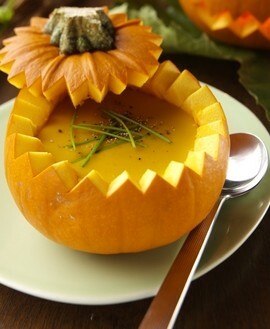 I was introduced to pumpkin soup when I lived in Australia. It was intriguing and, honestly, I wasn’t sure what to expect because, well, pumpkins were for carving and lattes. It arrived with a dollop of sour cream and chives and I was hooked from the moment I tasted my first bite. Until that point in time, every soup I had eaten was either veggie soup or something cheese based (like broccoli and cheese). So to eat something creamy, but not cheesy was crazy! And at that crucial moment in time, I realized WE WERE USING PUMPKINS ALL WRONG!!!! At the time, it never entered my brain that I would want to make it. Oh no no no…it was probably too hard. I mean, it was pureed. And who knows what kind of weird spices were involved. Nope, I was just happy to eat my pumpkin soup out. Until, of course, Jaime came along and introduced me to roasting (of course, we have to roast them!). A note about pumpkins and this soup. I use baking (aka smaller) pumpkins, but I also make this a lot with acorn or butternut squash. They’re all in the same family–just mix and match with what you find at the store! Preheat oven to 500F. In a large bowl, combine the pumpkin, carrots, and onions. Drizzle with olive oil, salt and pepper. Mix well to ensure all pieces are coated with olive oil. Place on a baking sheet and spread evenly. Place head of garlic also on baking sheet (I like to put it in the center! ), drizzle with olive oil, salt, and pepper. Bake for 30 minutes. In a large stockpot, bring veggie stock to a boil. Carefully add roasted veggies, except garlic. Remove garlic cloves from skin by squeezing gently at the bottom (careful it’s hot!). Add to the stock pot. Once everything has been added, puree soup. I use an emulsion blender (best soup puree-ing device ever! ), but you can carefully use a blender (small batches–no more than 1/2 blender full, leave the cap off, but cover with a towel and blend slowly…otherwise, you risk exploding hot soup over you and your kitchen!) or food processor. Once soup is pureed, add cream and nutmeg. Taste and adjust spices. Serve with a garnish you can be traditional and go with sour cream and chives, but I usually don’t have either on hand and use greek yogurt and cilantro, which in my humble opinion is tastier! You can also go uber-simple and used freshly ground pepper as a garnish, but the sour cream or yogurt give it some nice tang and adds an extra layer of yummy. Or you could be uber-fancy and serve it in a pumpkin! However you like it, you’re gonna love it! BUT! that’s not why we’re here (and he never shared that recipe…dammit! probably out of fear that I’d turn into a chicken truffle lasagna! )…we’re here for soup. Jaime made the best soups–his piece de resistance on his soup line-up was definitely his asparagus soup. soup is simple, stupid. you season and roast your vegetables, you put them in stock, puree, add cream and more seasoning and done. even you should be able to handle that. Thanks for the vote of confidence, Jaime. I went home and tried it and, holy crap, who knew roasting could make it that much more amazing!!!!!!!!!! I have always been a lover of soups. They’re warm and hearty and can be very healthy (unless you add 1lb of velveeta, in which case they’re UBER DELICIOUSLY CHEESY!). Plus they’re great for clearing out whatever vegetables that need to be eaten! Probably if I have to narrow it to only one, I’d pick Tortilla Soup (but pumpkin and veggie soups are right up there!!). One type I’m not a fan of? Gazpacho. Weird, I know. But cold soups just don’t do it for me. They’re just too cold and uncaring (in my humble opinion–I’m sorry if I just stepped on your gazpacho loving toes!). That’s not a band or a school or something fancy schmancy from GoogleMaps (or whatever might pop into your head). It’s actually what I want to do with this blog. Oh sure, when I started out, I wanted to talk about travel and food and drinks and whatever…and that’s not going to change. What I’m wanting to do is give ET a bit more direction, resulting in more posts (which is one of my New Year’s Resolutions). I’ll give you a minute to cheer or sob loudly, whichever you prefer. So what’s the direction? Well, each month is going to focus on two things: a place (some I’ve been to and some are still on the To Do list!) and a featured food group (I’m not asking you to pull out your USDA Food Pyramid, I’m just going to focus my recipes a bit more). Don’t worry, though, there will be plenty of rambling on and on and on and on and…well, you get the idea. I’ve made my list and I’ve checked it twice, but I’m always open to suggestions–so feel free to comment about some things you’d like to see here–be it certain countries, certain recipes, or even more food and wine pairings. And if you don’t like this new direction, by all means let me know , so I can chuck a U-ie and try something else (I’m easy that way!!). But please be nice/constructive…because quite honestly, if you’re nasty and mean, I’ll probably just ignore you. Okay, first up: January, which is going to feature Soups and Portugal. Don’t roll your eyes, it’s cold here in New York in January (although not as cold as it is in other parts of the world) and soups are a great (and healthy!) way to warm you on a cold winter night. Cliche’? Yes, but amazingly tasty! And no, I’ve never been to Portugal, but I LOOOOOOOOOOOOOOVE me some port (more about that later! ), so off I go to do some research! It has always been a tradition in my family to eat black eyed peas on New Year’s Day for good luck. Somewhere along the way, I was informed that I needed to add collard greens for good prosperity vibes. When I arrived in New York City and offered to make peas & greens for New Year’s Day, everyone stared at me like I had 3 heads and just swallowed The Empire State Building! “We just kiss at midnight,” is what I heard most often. Okay, so it can’t just be my family and friends. I feel there are others out there who must have New Year’s Day traditions, other than spreading mono. For example, did you know that in Equador they burn a scarecrow in an effigy of ending the old and starting anew? In Spain, it’s eating 12 grapes…at once, because apparently it brings you good luck to look like a chipmunk. If you’re in the Coney Island Polar Bear club, you take a dip in the icy Atlantic! In Denmark they break plates–OOOPAH!! oh wait that’s a Greek exclamation! But speaking of, in Greece they eat cake with a coin baked in and the person who finds the coin gets good luck all year long. Austrians waltz. Not to be confused with Australia, where it’s warm and sunny and my new years there seemed to involve a beach and heaps of champers! In Ireland, they bang Christmas bread on the wall to chase away bad spirits. If Irish Christmas bread is anything like fruitcake, I think it’s an amazing use for the fruitcake! Obviously, there are many, many more out there, but regardless of how you celebrate–enjoy the day! Here’s to a happy and prosperous 2014! Happy New Year! !